The Human Granzyme B kit is designed for the rapid detection of human Granzyme B in cell supernatant and whole cells. Granzyme B (also called Cathepsin G-like 1; Cytotoxic T-lymphocyte proteinase 2; Fragmentin-2; Granzyme-2; Human lymphocyte protein) is found in cytotoxic lymphocytes, NK cells (natural killer), and cytotoxic T cells. Secreted with Perforin, which creates a pore in the cell membrane, it enters the target cell's cytoplasm and triggers apoptosis through caspase activation. 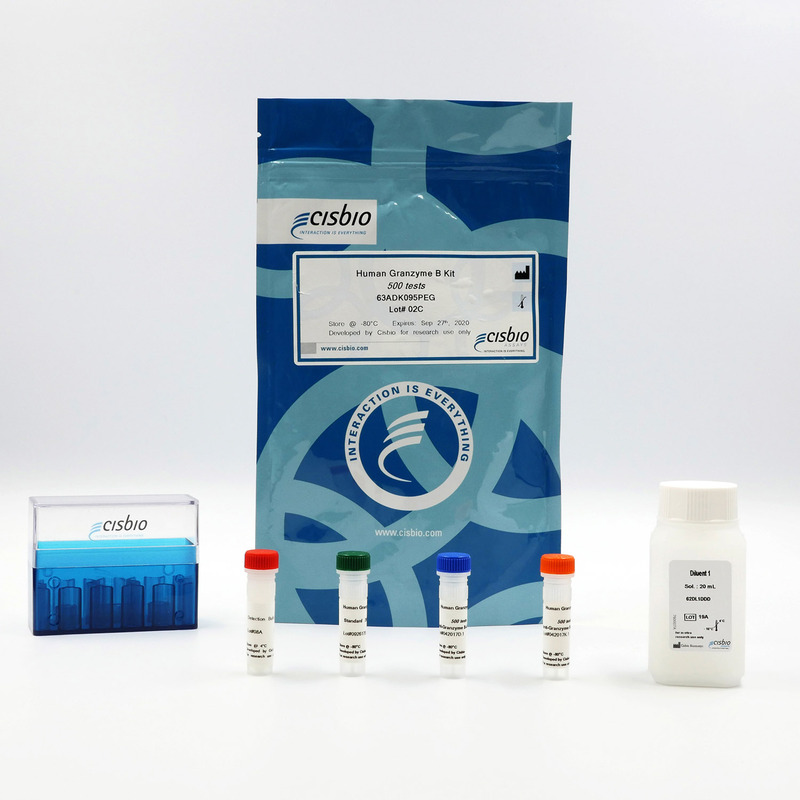 This kit is designed for the rapid detection of human Granzyme B in cell supernatant and whole cells. The assay enables high throughput without any washing steps, thereby saving time compared to ELISA. The Human granzyme B is a sandwich immunoassay involving two specific anti-human granzyme B antibodies, respectively labelled with Europium Cryptate (donor) and d2 (acceptor). The intensity of the signal is proportional to the concentration of granzyme B present in the sample. The assay protocol, using a 384-well small volume white plate or a Cisbio low volume 96-well plate (20 µL final), is described on the right. 16 µL of cell supernatant, sample, or standard is dispensed directly into the plate for detection by HTRF reagents. The antibodies labelled with HTRF donor and acceptor can be pre-mixed and added in a single dispensing step to further streamline the assay procedure. The assay can be run in 96- to 384-well plates by simply resizing each addition volume proportionally. Different cell densities (4K and 2K) of TALL-104 cells (Effector cells) were co-cultured with or without K-562 cells (Target cells) in suspension under 16µL in 384-well sv microplates. Cells were incubated for 16 hours at 37°C - 5% CO2. After co-culture, 4 µL of the HTRF Granzyme B detection reagents were added. The HTRF signal was recorded after an overnight incubation at RT. Different cell densities (50K and 25K) of TALL-104 cells (Effector cells) were plated in suspension under 50µL in 96-well plates. TALL-104 cells were co-cultured with or without K-562 cells (Target cells) for 16 hours at 37°C - 5% CO2. After co-culture, 16µL of cell supernatants were transferred into a 384-well sv white microplate and 4 µL of the HTRF Granzyme B detection reagents were added. The HTRF signal was recorded after an overnight incubation at RT.